Apple Music is a popular streaming music service offering three-month free trial for new subscribers. A great many people sign up to give the service for a try. But for some reason, many of free trial users may decide to discontinue the experience and cancel Apple Music subscription before the free trial is up in order to avoid being charged ($9.99 per month or $14.99 per month for a family subscription) for automatic renewal by default. 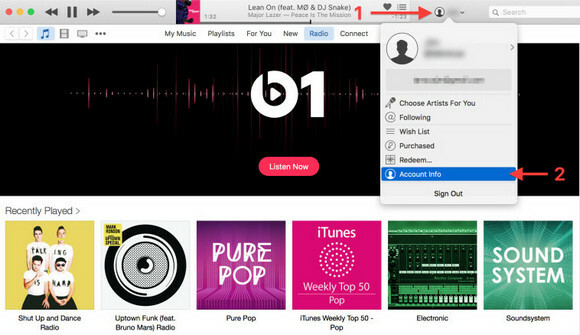 Here’s a quick and easy step-by-step guide to cancel your Apple Music subscription on your iOS or iTunes before the free trial ends. Step 1. 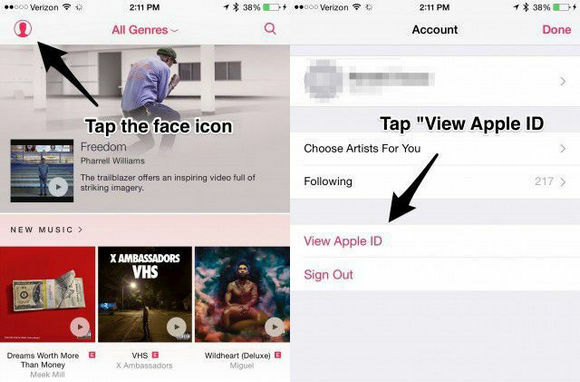 Tap the user account avatar on the upper left corner of Apple Music app, and then tap 'View Apple ID'. You'll be prompted to enter your Apple ID password. Step 2. 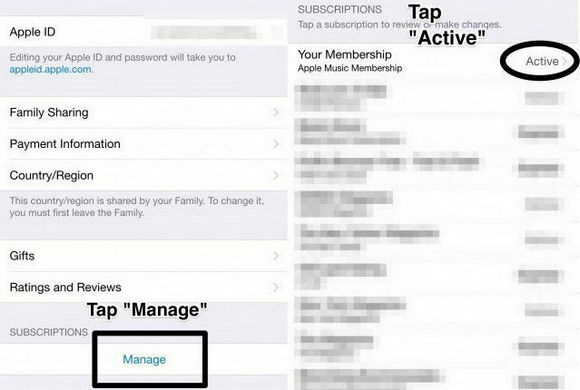 Click “Manage” under subscription. You will see Apple Music Membership on the top. Tap button “Active” next to it. You will then see all the details about your Apple Music membership. Step 3. Tap button “On” next to Automatic renewal. There will be a pop-up window asking “Turn Off Automatic Renewal?”. 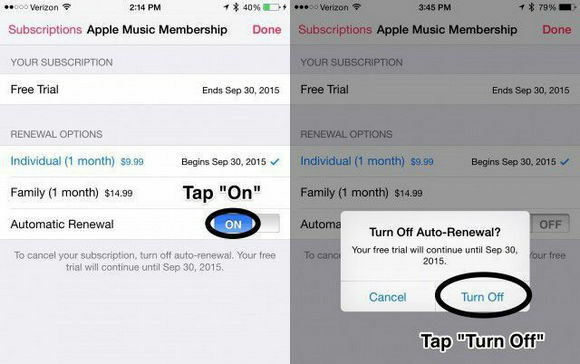 Click “Turn off” and you’ve finished cancelling the subscription for Apple Music. Step 1. 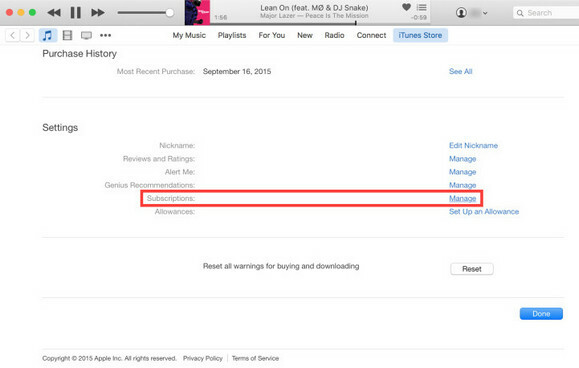 Launch iTunes and sign in with the Apple ID associated with your Apple Music free trial. Click your user account avatar on the top right. Choose Account Info in the drop-down menu and then enter your account password. Step 2. When you are in the page of Account Info, scroll all the way to the bottom until you see the “Setting” part. Find Subscriptions and then click “Manage”. Step 3. 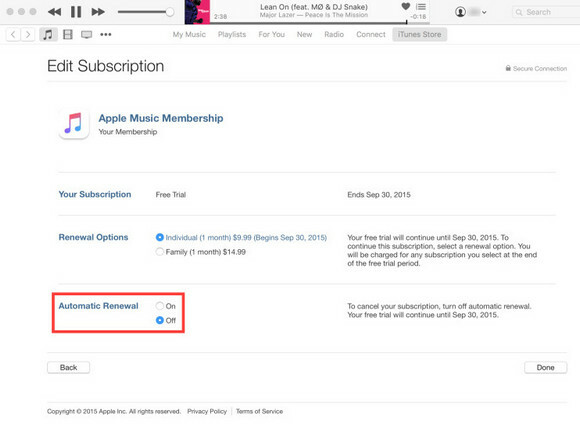 Click button “Edit” to the right of your Apple Music subscription and then find “Automatic Renewal” and click “Off”. You will see a prompt asking “Are you sure you want to turn off auto-renewal?”. Click “Turn Off” and everything is done. Now that you’ve cancelled your Apple Music subscription, Apple Music won’t charge you anymore, but you will lose access to all the songs of the service after your three-month free trial expires. Wanna to keep Apple Music after cancelling the subscription? Move on. The following extra tips will surprise you and make your day.